AKIHA WARD CULTURAL CENTER BY CHIAKI ARAI Archi-new - Free Dwg file Blocks Cad autocad architecture. Archi-new 3D Dwg - Free Dwg file Blocks Cad autocad architecture. 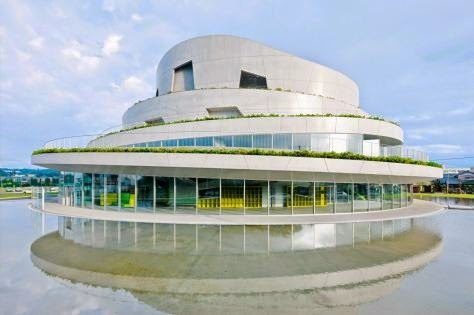 Located in a district famous for railway industry in Niigata city, Akiha Ward Cultural Center is a 3000m2 public theater with 496 seats. This building is designed to be the cultural incubator for the locals who have long-waited for it. Sitting on a 17000m2 former baseball field, the structure, landscape and parking are organized along the arc of baseball field to evoke the site memory. The surrounding area is a residential district on a vast flatland with few small hills. Following some characteristics of some hills, the global formation of the building is terraced landscapes where people can mount and take in the panoramic view. The planning has been developed through workshops with the locals. Several rooms and functions were added in response to their requests. From the competition phase, countless transformations changed the building outline from a precise circle to a distorted circular form composed of 46 different arcs. The planning diagram is stratified in the order of exterior corridor, entrance lobby, functional rooms, backstage corridor, the main hall. Due to the simple diagram, several functional rooms such as practice rooms and dressing rooms can be used from both entrance lobby and backstage corridor. This improves operational availability. To accommodate the gap between the global formation and the planning based on the workshop, the structural concrete walls are bent and twisted to reach the balanced support points of the roof slabs. The main hall is like a concrete cave under a hill. The structural element itself works as acoustic reflectors which give extraordinary acoustics by the force of its high specific gravity. The heavy solid wall and ceiling can reflect the lower sound ranges which conventional wall materials absorb. This provides us with special experiences which makes you feel as if you were at the concert in a natural cave, and not in a building. To optimize the acoustic effect, the concrete structure is perforated like a net, and the porous aluminum sheets are installed in the holes as acoustic absorbent. Interior finish of the concrete structure of the hall is fully-dabbed for sound diffusion. With the lighting effects, the solid concrete looks sometimes massive, sometimes weightless, and implies warmth of human hands. Source: Chiaki Arai. Structural Engineer: TIS&PARTNERS Co., Ltd.